Thinking of some fun ways to grow extra love in your home? Spend some time together with kids doing Valentine’s Day crafts and activities. All you need is lots of cuddles, a little time, patience and some craft supplies. 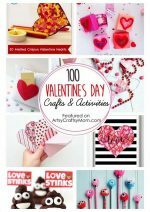 Here are 15 Valentine’s Day art & craft ideas for everyone to enjoy. Make a paper heart garland – a simple paper craft for kids from howaboutorange.com. Whitney McAdams shares her idea of making a Valentines Wreath using old paper, cardboard, ribbons and lots of colors. Here is a super fun craft crayon shaving hearts from skiptomylou.org. Kids would need help with using iron, cutting and hanging. It can be used for decorating windows or any other places of your choice. 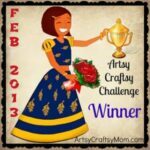 2littlehooligans presents this Valentine’s Day yarn craft with yarn wrapped around wooden pieces. So simple, yet so attractive! Valentine heart button craft for kids from handsonaswegrow.com shows ways of using various colors and shapes of buttons into a colorful and pretty craft. Great for small kids too. 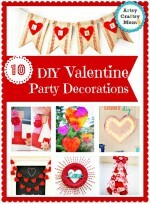 Here is a simple valentine craft for kids with toilet paper roll and construction paper. Make a simple valentine day wreath – thethriftress.com shares the complete tutorial for making a valentine wreath using toilet paper roll. Another valentine heart garland craft with paper and staples. Quick and easy. Simply staple together the cut out paper strips and decorate! Cupcake liner cards for Valentine’s Day. With multicolored ribbons, cupcake liners and cardstock, you can help your little ones make these cute little cards. Make a friendship garden of Valentine heart flowers – A simple craft for kids with colored paper, sand, glue and paint. Perfect for making a wall hanging for the special day. 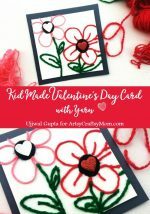 Here is a Valentine heart 3-D flower craft – You can get the step by step method of making a 3-D flower using paper hearts and glue. Make a cute valentine’s heart bracelet for little hands. Kids would love these accessories. It’s a perfect craft that would typically take a few minutes to create a cute bracelet. Kids can decorate using glitter, paint and any type of embellishments they can probably think of. Heart sun catcher craft from whereimaginationgrows.com – Using wax paper, beads, buttons and glue you will be able to make attractive sun catchers in the shape of a heart. You may have to plan ahead, as this craft would need some time to dry up the glue. Salt dough valentines decorations from red ted art. We all have seen salt dough decorations. Here is a lovely heart-shaped decoration made out of salt dough recipe that makes a perfect adornment for Valentine’s Day. Craftymorning.com shares a fun idea of making a paper heart fox for kids. 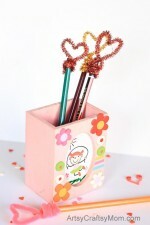 With different sizes and colors of paper hearts, you will be able to make this cute fox faces.